When Mariela Zepeda is on the clock, time is precious. Zepeda works quickly, her nimble fingers grabbing everything from bottles of pills to boxes of condoms. She’s employed as a "picker" at a CVS distribution center in Patterson. Everything she picks, she packs into crates, which then get shipped to CVS stores around Northern California. The items end up on store shelves, ready for customers to purchase and start the whole cycle over again. Zepeda is one of thousands of workers in the Central Valley who labor in the distribution industry. The business sector is booming, in part due to the growth of online retailer Amazon and its commitment to delivering consumer goods to your doorstep at ever faster speeds. Local governments have welcomed the boost in employment, and they are even investing in training to prepare young people to take the new jobs. But there are questions about whether these jobs pay enough to be long-term solutions for local residents. First off, Zepeda said, pay is better. She makes $14.79 an hour. For entry-level distribution jobs, companies advertise starting wages of $12 to $14, sometimes with benefits. They also tout the opportunities to advance within the distribution center, potentially into management positions. Patterson has about a dozen distribution centers nestled alongside Interstate 5. There's one for Grainger, Kohl's, Restoration Hardware and Amazon. The town, like others nearby, is betting on the industry, hoping it will provide jobs for future generations. Philip Alfano is superintendent of the Patterson Joint Unified School District. The region has the jobs to prove it. Since 2000, warehouse and transport jobs like trucking in Stanislaus County more than doubled, from 4,000 to over 9,000. “So the question was, who is going to take those jobs?” Alfano said. Patterson residents, Alfano hopes. That's why he helped start a vocational program at Patterson High to train kids for the jobs. 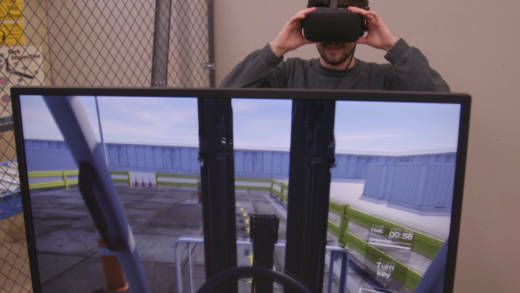 The district used state grant funds, and chipped in its own money to build a model warehouse, complete with virtual reality forklift simulators. Teacher Hilario Garcia used to work in the distribution industry, and he gets choked up about his kids getting jobs. 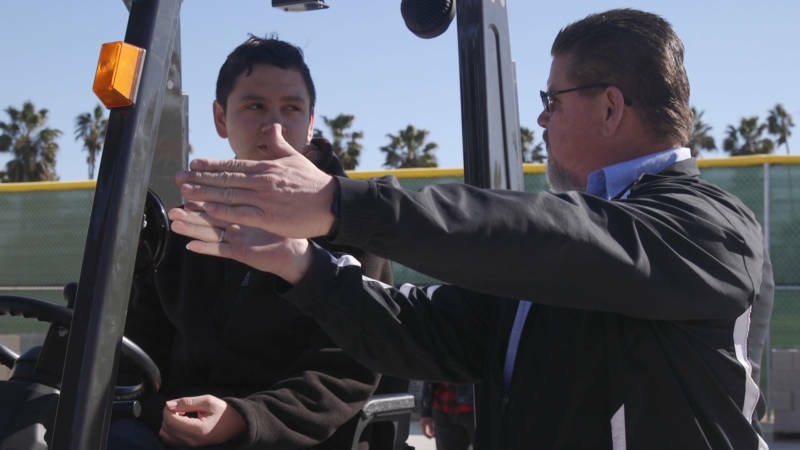 Distribution helped Garcia get his start, and it is bringing in more entry-level jobs to an area where employment rates have lagged. But is the industry enough to sustain a community in the long term? Can workers afford a house nearby and support a family? The city of Tracy is grappling with these questions. It’s about 30 minutes north of Patterson and is another hub for distribution. The industry grew under Michael Maciel, Tracy’s mayor from the end of 2014 to 2016. He represented a strategy of taking "advantage of this growing segment of the economy,” Maciel said. Now though, he said, Tracy’s City Council has started taking a more critical approach to the industry. “In the council there were voices that said these aren't the kind of jobs we want in Tracy,” he said. Shelley Burcham is Tracy’s economic development manager. “We know that there are citizens that require these entry-level jobs, or that's their skill set, but we want to up the game,” Burcham said. The hope is to lure industries with better-paying jobs -- sectors like tech or high-skilled manufacturing. Burcham said a big problem right now in Tracy is that most of its community spends several hours commuting each day for work. Local jobs often do not compensate people enough to afford Tracy, which is on the outer edge of the Bay Area’s real estate crunch. “About 70 percent of our resident workforce actually commutes out of Tracy every day,” Burcham said. Where do they go? To better-paying jobs in Fremont, San Jose and San Francisco. Tracy’s City Council wanted to know how much a job would have to pay for someone to afford to live in the city. They called this a “head-of-household job.” After crunching the numbers on real estate prices and cost of living, they arrived at a figure of $72,000 a year. Most jobs at a distribution center don’t pay that much. As Tracy tries to bring in higher-paying industries, the distribution business here continues to grow. Amazon just opened a second fulfillment center, and now it employs over 3,000 people between the two. In many ways the high-profile company has become the face of the distribution boom. Local newspapers track the company's growth and expansion plans. Local politicians debate the quality of jobs and the potential impact of automation. Residents speculate how the future of shopping will affect their own local retail. Amazon's two squat complexes spread out over large grassy lots in what was once expansive, unbroken agricultural land. As soon as you pass into the building, you are enveloped in sound. Noises made by human workers and machines ricochet off concrete and metal into an indistinguishable industrial din, punctuated occasionally by the beep of a forklift backing up. Conveyor belts compose the base of this droning. They snake around the entire building, taking abrupt turns, spiraling from ceiling to floor, alternating from metal rollers to long treadmills, speeding up, slowing down, crisscrossing and finally converging like lanes on a large and complex freeway. An endless stream of brown boxes ride these pathways, traveling from human -- the pickers who fill them with items -- to the bays of trucks waiting outside. Many will take the same roads as commuters of Tracy, away from the Central Valley to the ranks of consumers in the urban centers of the Bay Area. Ashley Robinson, an Amazon spokeswoman, said the jobs at the fulfillment centers may not be long-term solutions for everyone. “Absolutely we acknowledge that for some folks a job here at Amazon may be a lifelong career path, and for others it might be the step that they need between step one and, you know, step three," Robinson said. The Tracy fulfillment center has a classroom and a career program to help workers find jobs at Amazon or even elsewhere. At the CVS distribution center in Patterson, Mariela Zepeda said the company offers flexible schedules to college students like her. The CVS job is helping her pay her bills and go to college, but Zepeda says she doesn’t think you can raise a family in Patterson with most jobs at a distribution center. A lot of places. Zepeda is not just talking about the distribution industry. This is Zepeda’s general feeling about employment: There are few jobs that pay enough for people to live where they work. She worries that with automation, the whole situation is just going to get worse.